You have a blog up and running, and get some pretty good traffic. After creating and sharing your content, there is nothing else to do, right? Think again. Every blogger should take into consideration factors that affect their blog, including SEO, social media, site speed, and security. After thinking for a while during a late-night blogging session, today I will bring to you 5 tips to streamline your blog. Lets get started. It doesn’t matter what people say, there will always be that person that overwhelms their visitors with clutter. Clutter such as overoptomized keywords, tons of ads, and just too much stuff going on can ruin the experience for a user and cause them to never return. In addition, this type of disorganization on a blog can make the search engine’s job much more difficult and seriously affect your rankings. Our advice: Keep it clean. Keep it minimal. Keep it classy. Another point that must be made in order to streamline your blog is to create content with users in mind, not just search engines. Yes, it is important to optimize your keywords and content structure, but if readers don’t understand what you are saying, they may leave the site very quickly. And when this happens, click through rates decline, leading to much lower rankings. Our advice: Write like you were talking to a friend, not your computer. This makes writing for users much, much easier. This is one of the biggest phrases in the blogging industry right now. And it makes sense why. In a connected world where people are just a tap of a button away, it is very easy to connect with readers and other bloggers using social media. And with pieces of content going viral every day, reaching the right audience can mean unfathomable success. However, social media can be a double edged sword. Users don’t like to be sold to, so make every effort possible to stay neutral when trying to suggest a link. Also, carry on the conversation even if you are selling something to get the most out of your engagement and social media touchpoints. Our advice: Take social media seriously, but don’t abuse it. When done right, users will react in a positive, engaging way. Another great way to optimize your blog is by referencing others with links. If you find a great piece of content, give the other writer credit for it! This is a great way to build the blogging community and also rewards others for their hard work. Who knows, that writer may find your link and then link back to you in return. I have had this happen time and time again, and have gotten quite a bit of traffic and guest posts through this method. Our advice: Email other bloggers when you link to their post. They will likely share that post with their social media circles! This is probably one of the easiest and most efficient ways to optimize your blog if you are using WordPress. HostGator Optimized WordPress is hosting specifically tuned for the WordPress CMS, so you know it will be super fast and work very well with your blog. One of the main benefits of using this type of hosting is that it takes away a lot of the stressful, time-consuming tasks that many bloggers don’t have time for or know how to do. Optimized WordPress takes care of updates, including plugins, WordPress Core, and security. These updates happen automatically so you can take a step back and do what you do best; grow your content and focus on spending time engaging with your readers. In addition to the worry-free aspect of this hosting, HostGator plans come backed by 24/7 live support, easy one click WordPress installs, and tons of other features including professional design and marketing services, domains, and many other features. 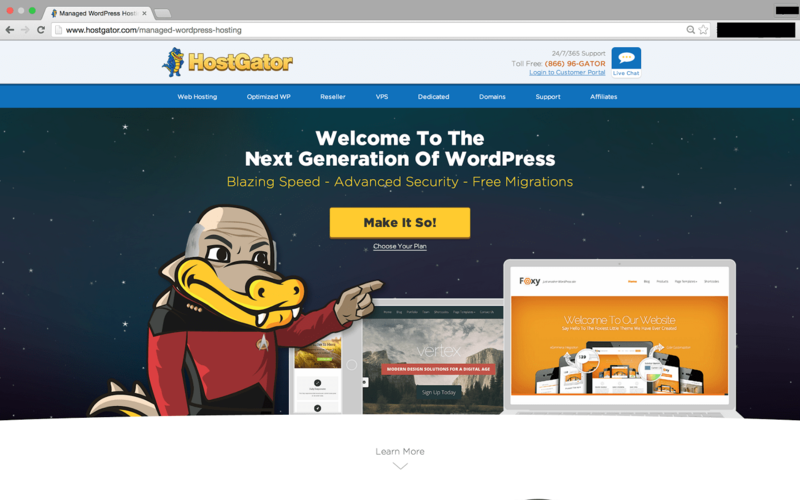 If you are looking to step up your blog optimization efforts, then check out HostGator Optimized WordPress now!